This mani is actually a recreation of a mani I created around this time last year. Originally, I did all the polka dots on a white base, but this year I decided some more red was in order. I think this mani could of worked out with any number of color combinations. A really funky variation could be a different base color on every nail. 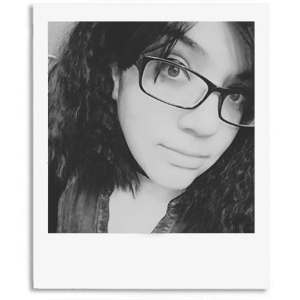 Kind of retro feeling. The macro shot is one of my favorites of all time. I'm really proud of how the lips turned out, but I think I could of been neater with the polka dots. What do you guys think? Any PLL fans excited for tonight's episode? As always be sure to check out the other ladies participating in this weeks Red Coat Tuesday. That smile is totally awesome! Love the lips!! Red, black and white are so classic together! Cute! I did lips for my Red Coat Tuesday mani this week too! N entire bag of chocolate is sometimes necessary!! These turned out great! These are awesome!! The lips turned out great! This is absolutely stunning! It has a pop art feel to it. Perfection! 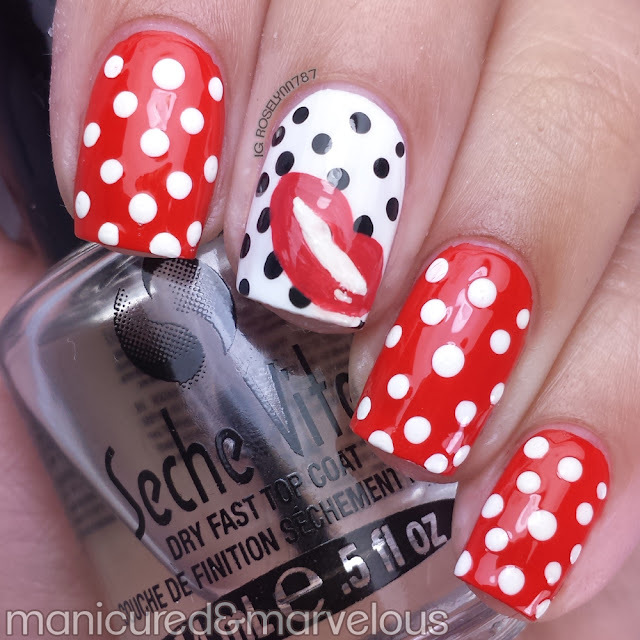 Love-love-love the red with white polka dots! I need these nails! I love this mani! Red, white, and black are such a classic combo! It reminds me of Minnie Mouse :D perfect dots! 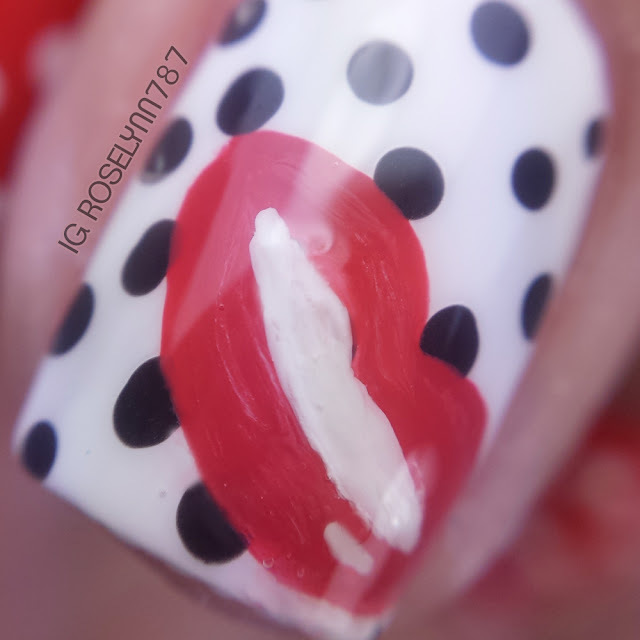 I love the retro feeling of this mani! This is so fun! It has sort of a pop art vibe! This was a fun V-Day design! I like this! Your dots are perfect! I love the red with white dots. This is perfect for Valentine's day! Oh i think this is perfect! 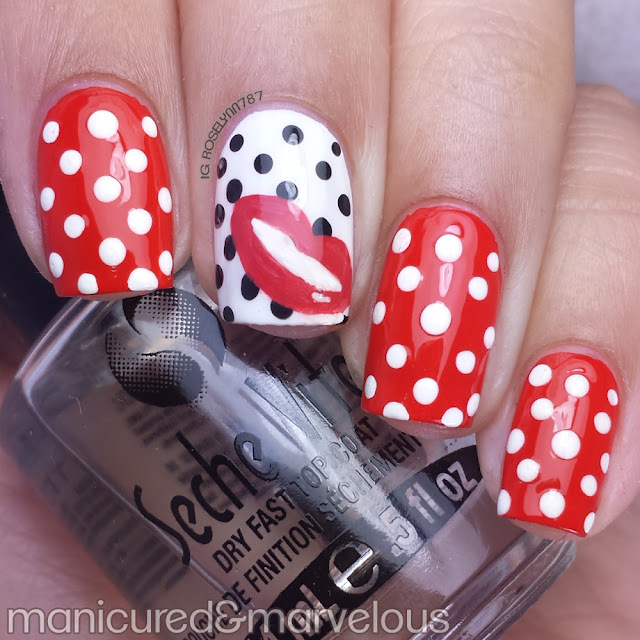 Polka dots and red lips, yes please!! This is a perfect Pop Art mani! Very cute! Those lips are fabulous! This is such a cute design, and perfectly executed! Looks adorable. Reminds me of Mickey and Minnie :D I love red color, and would love to join you guys in PLL Red Coat Tuesday. Ah! The lips are so perfectly done!! You remind me that I need to sharpen up on my dotting skills, haha! I love the pop art vibe! You did a stellar job with the lips!